Jeffrey's Beach is a flat 10 minute walk on a 4 wheel drive road. 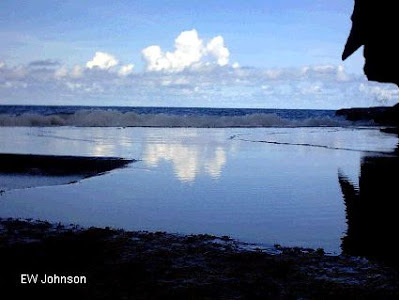 The spring water from Talafofo Falls enters the ocean at this beach. There is not much sand here except for some sparkling black mica. There are beautiful high cliffs on either side of several terraced pools. The pools are shallow with some deeper holes. 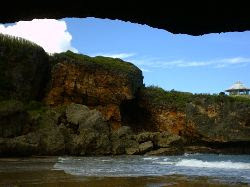 Jeffrey's Beach is a good place relax in the warm water and enjoy the picturesque surrounding cliffs. The black sand is the mineral magnetite. Try picking some up using something metallic and they should stick. Awesome blog! Thanks.